Now we come to the last two vegetables I’m trying to grow. Well, I should say vegetables and a fruits, because the humble tomato is technically a member of the fruit family, owing to its seed rather than root-based nature. 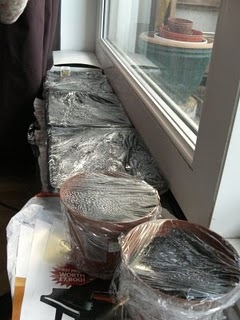 These plants have to be started off under cover or in a greenhouse, but as this is the London Vegetable Garden / Balcony Project, I’m using cling film covers and keeping them inside the flat in front of the warm window to start off with. That seasonal favourite of British greenhouses, I’m attempting to grow my ‘Tomato Maskotka’ (Lycoperiscon Iycoperiscum) on a sunny (English weather permitting!) balcony. I really do believe that tomatoes are a quintessential part of any British garden – I can still vividly recollect childhood memories of going into a warm greenhouse and being hit by that (always warm) sweet, tomato-like smell. I’ve started off by sowing the seeds thinly in three seed trays, covered with cling film. The packet instructions dictate that these seedlings should stay in their trays until they are around 4 inches tall, before being transplanted into a grow bag, which incidentally, I struggled home with on the train last week! The final variety I planted last week is the hardy Runner Bean. I’m using the ‘Stringless Armstrong’ variety (Phaseolus Coccineus), which is the same variety I managed to grow with (some) success on this very same balcony last year. The plants shot up to impressive proportions, however the crop didn’t yield a great deal of beans. I’ve been told by friends that this is probably due to planting in compost and the beans not receiving much nourishment, as well as the polluting factor of the train line that runs adjacent to the flat. This year I have planted the seeds in small pots and will transport them to large pots when ready, this time prepared with a mix of grow bag compost and a regular feed. So now we’ve established all of the vegetables so far. I’ll be referring to the days as numbers going forward, and these all date from the day I planted everything. Therefore, Sunday 5th April is ‘Day 1’ and so forth. The London Vegetable Garden is well and truly underway!